Bhengu belonged to the Bhaca sub-group of the Zulu, but his family members were Roman Catholic converts and he apparently remained devoutly religious all his life. Catholic imagery inspired much of his early work and at times he received commissions from church patrons.2 As a Christian, Bhengu was a virtual outcast in terms of his own culture, but at the same time he was considered – at least by whites – to be a part it, and called upon to accurately record it. This demand came not only from tourists but from researchers such as his very first mentor at Centecow, the missionary doctor Max Kohler, who commissioned him to illustrate such publications as The Izangoma Diviners (published 1941). Aside from his many portrayals of Zulu diviners (izangoma) and medicine men (iNyanga) (plate 24), Bhengu also produced informal portraits that show aspects of Zulu culture persisting despite the adoption of colonial attire. In the specific examples of plates 22 and 23, there is a comparative progression in terms of two young Zulu men. The younger man has had his pierced earlobes fitted with hollow reed earplugs, while the other has now attained maturity by virtue of his ability to wear the then still-fashionable decorative earplugs with his earlobes further distended, as well as a moustache. Bhengu painted exclusively in watercolour and sepia ink on paper. Although he painted a number of polychrome works as in the case of his landscapes Young boy herding fat-tailed sheep (plate 21) and Fighting the fire (plate 27) the bulk of his output was in monochromatic sepia, largely because he could not afford a wide range of colours. The congruency between his sepia works and the then-fashionable taste for sepia-toned photography may also have been a consideration in terms of the marketability of his work. His earliest paintings and drawings date from 1926, but are seldom inscribed with a date, although they are almost always signed. The early work from 1926 until the later 1940s is the most sought-after in terms of aesthetic interest, and is discernible by the use of the spelling ‘Bengu’ in the signature. The use of ‘Bhengu’ is found only on his later works. The Campbell Smith Collection contains a number of earlier works roughly datable in the period c.1929–c.1936. The amateur ethnographer Dr Killie Campbell, whose Africana collection includes a great number of his works, also commissioned Bhengu from 1942 onwards. An unusual work in the Campbell Smith Collection, which has a direct link with these commissions is Strengthening the quarry (plate 19). Campbell asked Bhengu to execute four paintings illustrating various stages of the First Fruits Festival of the Zulus. Two in the series were initially completed, but Bhengu abandoned the project and only produced others for the Killie Campbell Collection much later.4 Strengthening the quarry is clearly a study related to the commission that must have been sold to another party, because it was recently purchased from a source in the United States. Tim Couzens. 1985. The New African. Ravan Press: Johannesburg, p. 250. For further information, readers are referred to the essays ‘Bhengu: A Biography’ by Annelise Zaverdinos and ‘Bhengu in Context’ by Juliette Leeb du Toit in the catalogue Gerard Bhengu, 1910–1990: A Retrospective Exhibition. Tatham Art Gallery: Pietermaritzburg (1995). Cited by Elza Miles from the newspaper Ilanga Lase Natal in FUBA Newsletter, Sept./Oct 1992, p. 5. 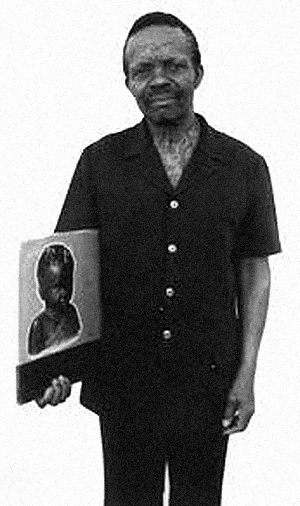 Born 1910, at the Mariannhill Mission at Centocow, KwaZulu-Natal; died K. Section, Umlazi, 1990. Training Self-taught; deterred from taking formal art training by mentors who feared that such training would spoil his natural talent. 1926–1931: Informal advice and encouragement in painting and drawing from medical practitioner Dr Max Joseph Kohler at Centecow. 1934–1937: Attended Edendale Training College and was informally mentored in art by John Nixon. Selected Exhibitions 1936: Empire Exhibition, Johannesburg. 1945: Non-European Exhibition, International Club, Durban. 1947: Group exhibition with Barbara Tyrrell, Hezekiel Ntuli and two other unknown black artists at the Durban Art Gallery. 1948: Solo exhibition, Gallery des Beaux Arts, Johannesburg. 1988: The Neglected Tradition, Johannesburg Art Gallery. 1993: Spiritual Art of Natal, Tatham Art Gallery, Pietermaritzburg. 1995: Panoramas of Passage: Changing Landscapes of South Africa. 1995: Spiritual Art of Natal, Tatham Art Gallery, Pietermaritzburg. 1996: Retrospective Exhibition, Tatham Art Gallery, Pietermaritzburg and Durban Art Gallery. Work in selected publications 1931: Illustrations for Max Kohler’s Marriage Customs in Southern Natal, published by the Department of Native Affairs. 1935: 28 illustrations for R.R.R. Dhlomo’s Izikhali Zanamuhla. 1963: 13 illustrations for Phyllis Savory’s Xhosa Fireside Tales. 1965: Illustrations for Phyllis Savory’s ,em>Gerard Bhengu: Zulu Artist, Howard Timmins: Cape Town. Collections Museum Afrika, Johannesburg; Tatham Art Gallery, Pietermaritzburg; Johannesburg Art Gallery; Albany Museum, Grahamstown; Killie Campbell Collections, University of Natal; Iziko SA National Gallery, Cape Town; De Beers Gallery, University of Fort Hare; Sanlam Art Gallery, Bellville, Cape. Photograph courtesy of Thatham Art Gallery. This highly unusual portrayal of an older woman or matriarch appears to be an early work by Bhengu, possibly painted in the late 1920s. The realism evident in the creases on her face and the hint of greying but very shortly-cropped hair on her temples make this an exceptional female portrait. It differs somewhat from the artist’s later, idealised more ‘photographic’ and marketable portrayals of a more submissive feminine beauty. The fact that it is painted in colour, and that the subject is integrated within a landscape setting rather than the aureole of the white of the watercolour paper is also unusual. She is set against a luminous view of the Southern Drakensberg Mountains. The only comparable work in the Campbell Smith Collection is his Portrait of a Pondo woman.1The subject in the latter, however, does not have the commanding presence so evident in this work. Portrait of a Bhaca woman in a traditional head dress seems reminiscent of Piero della Francesca’s Portrait of Battista Sforza (c.1472) (Fig. 1), the wife of Federico da Montefeltro, Duke of Urbino, with whom she is partnered in the famous Italian Renaissance diptych in the Uffizi Gallery in Florence. In both the Bhengu and the Piero the head and shoulders of the female subject are elevated above the horizon and profiled against the sky, suggesting an elevated societal and power-status over the landscapes behind them. In the case of the Bhengu, the stockade-like wall of branches suggests a kraal, indicating that this woman is possibly of high status or reputation. She wears an isicolo, a cone-shaped coiffure always worn by married women. These were made by rubbing clay mixed with animal fat into the hair, assuming a distinctive conical shape. These elaborate coiffures were fairly solid and a headrest would be used to assist in retaining its shape when sleeping. In more recent times, with women moving freely between an urban, western way of life and their traditional one, a detachable isicolo is often used. It can be usefully stored away and worn on special occasions. This woman also wears beadwork and an intriguing necklace of fur. The title of this watercolour may be subject to amendment since the subject does not have the ritual scarifications usually seen on the faces of Bhaca women. See ReVisions, p. 347, (plate 348).